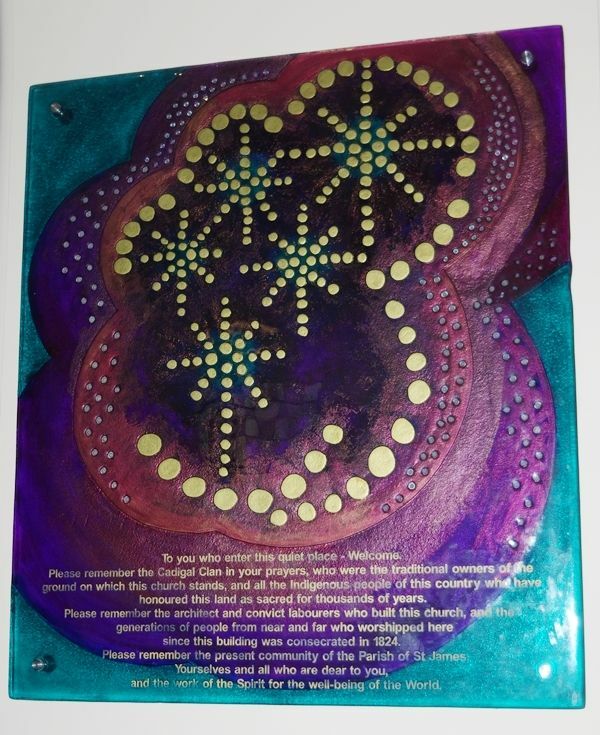 The plaque remembers the traditional owners of the ground on which the church stands, and the indigenous people of the country who have honoured the land as sacred for thousands of years. To you who enter this quiet place - Welcome. Please remember the Cadigal Clan in your prayers, who were the traditional owners of the ground on which this church stands, and the indigenous people of this country who have honoured this land as sacred for thousands of years. Please remember the architect and convict labourers who built this church and generations of people from near and far who worshipped here since this building was consecrated in 1824. Please remember the present community of the Parish of St James, yourselves and all who are dear to you and the work of the Spirit for the well-being of the world.